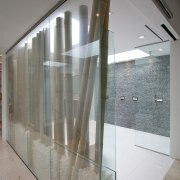 The glass wall with bamboo trunks screens the tub from the stairs. Space is often at a premium in a terrace house, but the owners of this Colonial Revival-style house found the perfect solution they built an extra floor on top. Architect Douglas Rixey says the new addition was part of an extensive whole-house remodel that has created a very contemporary interior. "The house was completely gutted and rebuilt to suit the owners' requirements, which included a light and airy master suite on the new top floor. The owners wanted the entire floor to be open plan with virtually no walls. Because a terrace house only has windows at the front and rear, we introduced a series of skylights to ensure the interior would be flooded with natural light." The cantilevered Boffi vanity features walnut wood veneer and integrated Corian sinks. 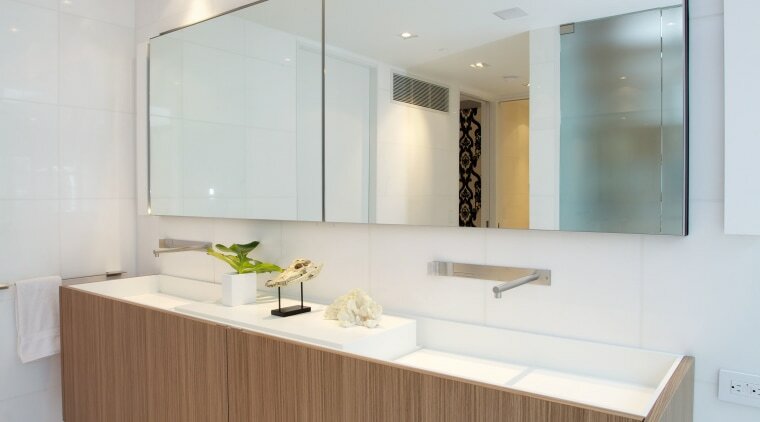 The mirrored medicine cabinets, which are partially recessed into the wall, provide additional storage. The master bathroom was designed in conjunction with Julia Walter of Boffi Georgetown, who says the suite has a resort-style ambience. 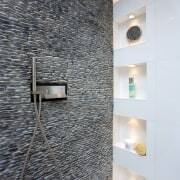 The high-end effect is reinforced by the wide opening between the bedroom and bathroom, together with the freestanding Iceland tub and a large wet-area shower with pebble wall. "Even though this is the only suite on the floor, a little privacy was required to screen the bath area from the stairs," Walter says. "So the architect added an electric glass screen with bamboo trunks the glass turns smoky at the touch of a button. 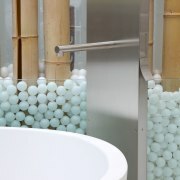 The Boffi bath filler also features the latest technology with a simplified lever operation to make the water hotter." A cantilevered vanity in walnut wood veneer continues the contemporary theme. 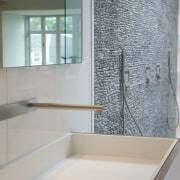 Matching sinks are integrated into the white Corian top and all plumbing is concealed. Wall-mounted taps retain the sleek, minimalist look. 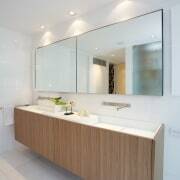 The vanity area also features partially recessed mirrored medicine cabinets, which are positioned so they appear to float. In keeping with the tropical feel, the space is further defined by contrastingtextures. 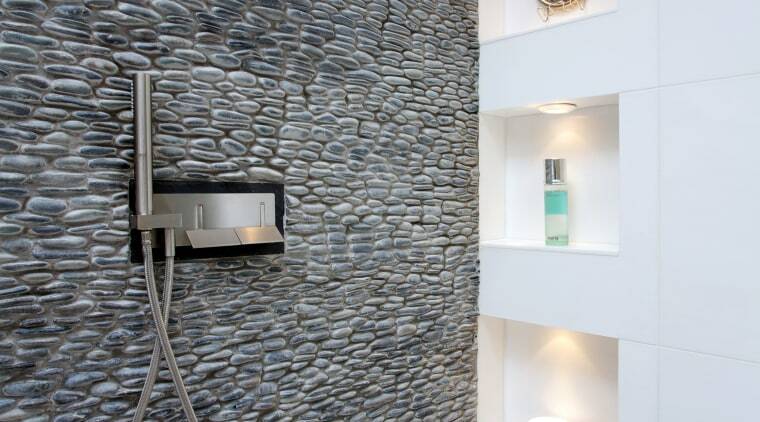 These include the pebble wall of the shower. Recessed niches beside the wall are illuminated. The suite also features a glamorous dressing room with mirrored cabinets, a black chandelier and purple window seat.